The small straps shown here are for flush mounted (inset) cabinet or cupboard doors. They are not for closet or room doors. These straps can be jamb mounted (mortised into the jamb) or face mounted on the cabinet frame. Screws and instructions are included for both methods of installation. Long narrow straps were common in New England. Most straps fit doors up to approximately 36" wide and are suitable for interior or exterior applications. 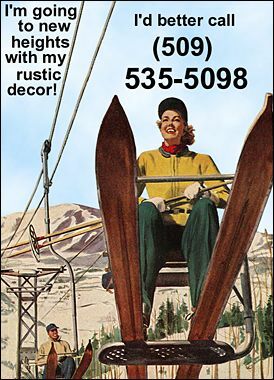 Call if your door is wider. Choose the correct pintle and please tell us the thickness of your door so we can provide the right length screws. Straps are 3/16" thick and 1.5" wide. These straps all fit 1/2" pintles. Bolts and lags not included. 20" long strap ( for doors up to 32" wide). 24" long strap ( for doors up to 36" wide). 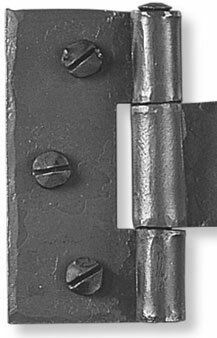 These forged iron surface straps are sometimes referred to as "dummy straps", because they have no functional hinges. 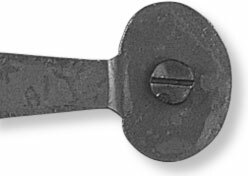 They provide the beauty of a strap hinge on a door that is already hinged or doesn't need hinges. One example is an overhead garage door. Three patterns, approximately 24" long, 1.5" wide, and 3/16" thick.